In his article “Longevity, production and efficiency in rugby kickers: a re-analysis of Ken Quarrie’s kicking dataset“, Eoin Gubbins are explaining different ways of looking at the dataset on which a study by New Zealand Rugby Union sports scientist Ken Quarrie, earlier mentioned in my post “What a study of rugby kickers can teach your business” is built. But – what he does, in a very interesting and well written article, is just that. He’s explaining that there is multiple ways to view a dataset. That leads to a missing focus. So in the article Eoin introduces a focus, something he wants to study. In this case – greatness. Eoin argues that the study doesn’t account for certain variables, but I would argue that until you’ve defined your focus, you can’t know which variables are required, obsolete or missing. I’m also not arguing with Eoin, or the commenters of The Score, about the fact that greatness probably involves more variables than the study used, but then the study was not intended to rank players by greatness, only on a percentage altered to account for kick location on the ground, the context of the match (based on score difference and time elapsed) and which stadium the kicker was at. So when wanting a list with the greatest kickers, Eoin has to come up with a definition of greatness – “true greatness involves production over a long period at a highly efficient rate” – to be able to create it. Greatness can be a lot of things depending on your view, but this was Eoin’s definition of it and when defining it this way, the study was lacking certain variables to be able to produce a list of the greatest kickers. So in that aspect Eoin was right. So definitions first, so we know what we are looking for/at. Then we can select and study the data appropriate for the definition. Otherwise it’s just a matter of opinion/view and that is not what evidence based coaching and learning is about. Thanks for a good article on some fascinating data, Eoin. And thanks for forcing me to think twice about definitions and data. Earlier today I read an article about a study on rugby kicking. So what can a study like this teach you about your business? In the blog post “Triggers of golden questions” I write about the questions certain situations raises. And this study is certainly a situation like that. Where and when do I perform at my best? Why there and then? Under what circumstances do I perform at my best? Can I create those circumstances elsewhere or more frequently? Which factors could be changed to create a more positive outcome? What would it take to do so? If I should do so, how will I measure if I get any effect out of it? Do I know who’s my best performer? Under what circumstances are that person performing at his/her best? What kind of circumstances should we avoid? Which are the key factors for his/her success? What can I and the rest of my team learn from that person? Can we create more of those positive circumstances without wearing my team out? Are they the same for everyone on the team or is it an individual thing? As you see, the questions raised by a rugby study, doesn’t differ from those that would be useful in a business environment. The answers might, but not the questions. Actually it might be even easier to find these questions and relate them to your business if it’s not about your business to start with. Then you’re not personally involved or biased in any way. So go explore other fields besides your own business. You might learn something about yourself! Every morning at work we have a stand-up meeting when our group talk about what we did yesterday and how that went, what we’ll focus on today and what we can prepare for tomorrow. The reason for this is so that the entire group can see what’s going on, who’s doing what and that all important tasks are taken care of. It’s also a lot about learning. Why did it go well yesterday? What did I do that made that success possible or what was the main reason to my failure in completing the tasks I had focus on? In a very structured meeting like this, where everyone answers the same questions with a specific purpose, it’s easy to find the right questions to ask yourself and eachother. But what about outside a meeting like that? What triggers those questions? Those you actually learn from? then it is much easier to learn from a situation and turn that knowledge into action and actually change the situation – if that is what you want. This is an important part of coaching in both business and sports. For instance in the coaching model GROW. So asking the right questions at the right time is key to any kind of learning which is required for any kind of structured change. So how can you challenge the status quo? Questions like that are the golden questions, those you can learn from and challenge the status quo, the foundation of knowledge, change and improvement. So do I ask myself these questions constantly? All the time? Isn’t that very time-consuming? Well, yes, it could be. But it also makes changing things quicker and easier. So you have to find the right balance between challenging/questioning and actually performing work/change. Or, like in sports, how offence and defence in a team are interacting and working (hopefully) together towards a common goal. Cherish those situations and expose yourself to them as much as possible to learn more about you and your situation. Then apply the questions, and the answers to those will provide you with the knowledge you need to act, comfortable with the fact that you’re doing the right thing. This is of course not always as easy as it sounds. It’s a matter of practice to get better at this process – finding situations, asking questions, turning answers into knowledge into action and steering and following up those actions to create change, reaching goals and learning from the entire process. This continuous practice is called a lot of different things depending on their angle – continual improvements, Lean, Six sigma and so on, but whatever flavour you choose, the fundamental base of getting better at what you do is the same. No matter if it’s in business or in sports. So go find situations and people who trigger your golden questions. Happy hunting! Darrell Cobner of Cardiff Met Sport (@CPAUWIC) tweeted about Terra Incognita – Leading your team into unknown land. What kind of discoveries can you make about yourself and your team? Interesting read on tracking physical improvements in a relatively simple way (much like the Simple Frequency Form) from PropelPerform. I would, however, be careful to only implement this for players training for elite performance, not in regular youth teams/clubs. An easy to understand explanation of big data in sports: Big data can give athletes the winning edge. KPIs are one of the most misunderstood terms in the world of business as well as in sports. It stands for Key Performance Indicator. Key – as in something important, something vital. Performance – as in the action/process of performing a certain task. Indicator – as in indication, a hint of something. So it’s an indication on how well you are performing something. But what about the Key thing? The important stuff? Is the KPI an important indicator or an indicator of something important? Important indicators or indicators of important stuff? You see, we can measure anything and call it a KPI. That doesn’t means it is a KPI. It’s just lipstick on a pig. There are loads of important things in a company or on a rugby or football pitch that can be measured. If you do, you’ll get indications of important stuff. That doesn’t mean that those metrics are the game changing indicators, the information that leads to better decision-making, your best KPIs. But if you instead measure activity or processes to get important indicators, those which may help you make better decisions, then you’re on the right track. You’re using KPIs. KPI – a dangerous creature? 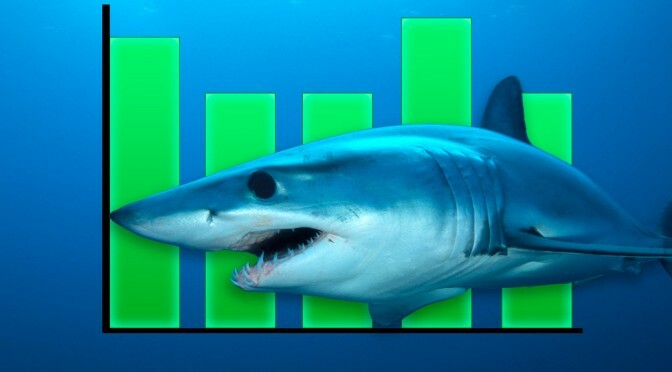 If KPIs were animals the would most likely be sharks. Beautiful, strong, necessary for the ecology in the ocean, but often misunderstood and extremely dangerous if pushed or mistreated. A good KPI can be beautiful (in a somewhat nerdy way), it’s definitely a strong helper in getting better results, I would argue it’s necessary to have them in one way or another to make really good decisions and, yes – they are misunderstood and potentially dangerous for your company’s or team’s desired results if you treat them the wrong way or measure the wrong things, like if you only get indicators of important stuff. So make sure to measure the right things! A KPI is a – leading or lagging – qualitative or a quantitative measure of how well you are performing against your critical success factors. In other words, it’s a measure of how well you are doing what you know will lead you to success. So now you just have to find out what leads you to success! Assuming you have clearly defined, measurable, goals based on your vision and purpose you can then write down your critical success factors for reaching those goals. What must be in place for you to be able to reach your goals? What are the key things you have to do to make sure you reach your goals? You want to go from where you currently are to the city of Smallville and be there by 21:00 today. A pretty simple goal which is easy to measure if you have reached or not, right? Either you are there at 21:00, or you’re not. I’m sure there are more of them, but for this example… well, you get the picture. I then check, with the frequency of Z times/hour, if my current speed is the same as X and if I have enough fuel (Y%) for the remaining way to go. So the right frequency is VERY important. By following my process and I’m checking my KPIs with the right frequency, I can be comfortable that I will reach my goal on time. If the KPIs show that I, under the current circumstances, might not reach my goal on time, I can make the necessary decisions and take action before the damage is done. I might have to change route, vehicle or something else to improve on my KPIs, meaning I will get to my goal on time. The KPIs are my important indicators of how well I’m performing what I know will bring me to my goal – my success factors. A lagging KPI in a store could be: Amount ($) sold during Q3?. It can only be measured after Q3 has ended and you can’t do anything to improve this KPI during this Q3. You can only improve on it the next time around. It’s reactive and has a low frequency. For instance you might have to measure number of customers/day and spent amount/customer to predict sales for Q3 and give you the opportunity to affect these KPIs to improve on the result for Q3. It’s proactive and has a high frequency. But what happens if the frequency of a leading KPI is too low? It becomes lagging! Make sure to avoid that. Too complicated or uninspiring KPIs will soon be forgotten because none cares about them and then they’re to no use at all. So keep it simple! And when you’ve had your KPIs around for a while, try to exchange them for fresh ones, even if they’re connected to the same success factors as the ones you currently have. Old KPIs lose their ability to give energy, so a new one once in a while could be a simple way of boosting your organization. So to sum this up – the purpose of a KPI is to help you, in an easy way, to make better decisions, to make sure you reach your goals!